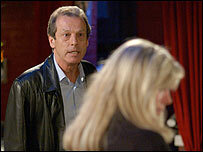 Leslie Grantham, who plays Den Watts in the BBC soap EastEnders, has apologised to the cast and crew after newspaper reports about his behaviour. A Sunday newspaper printed photographs of Grantham apparently exposing himself via a webcam from his dressing room. He also allegedly insulted four of his EastEnders co-stars. Grantham, 57, who returned to the soap after a 14-year absence in September, also said he planned to make a donation to charity as part of his apology. He said: "I would like to unreservedly apologise to the cast and crew of EastEnders and the BBC for the embarrassment that has been caused by recent newspaper allegations. "I would like to also say sorry and pay personal tribute to Kim Medcalf, Wendy Richards, Shane Richie and Jesse Wallace in particular, who have been caught up in the results of my deplorable actions. "I very much regret that a moment's stupidity has cast a shadow over what I consider one of Britain's best shows of which I'm thoroughly proud to be a part. " He continued: "I am wholeheartedly ashamed of my behaviour and feel that I have let down my colleagues, as well as my friends and family. "In some small recompense I intend to make a donation to charity as a mark of my apology." "Dirty" Den Watts was one of the soap's best-loved characters when it began in the early 1980s. He shot to fame as the landlord of the Queen Victoria pub, married to Angie (Anita Dobson), but originally left the soap when his character was apparently shot dead in February 1989. Some 16 million people tuned in to watch Grantham's comeback on 29 September, where he surprised screen daughter Sharon, played by Letitia Dean. He extended his contract for an extra year soon after appearing back in the EastEnders cast. A BBC spokeswoman said: "Anything that exposes the programme to embarrassment and any abuse of BBC resources is taken very seriously by the BBC. "However we do appreciate Leslie's sincere expression of regret and his decision to make a contribution to charity. "We do not intend to make any further public statements about this matter."